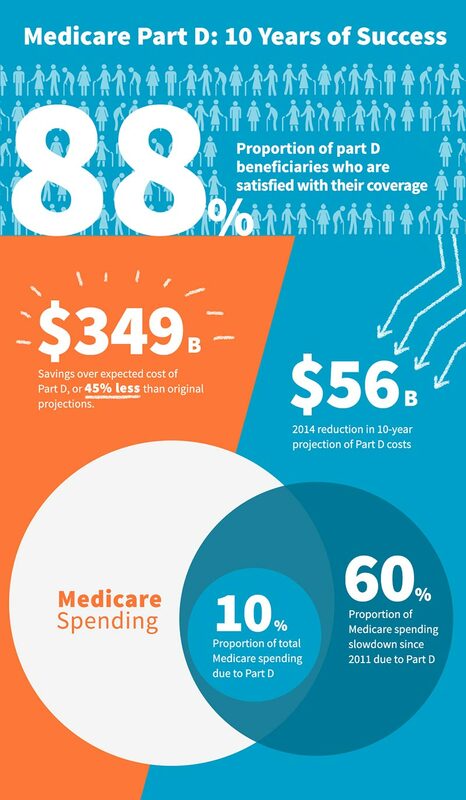 VIEW THE COMPLETE “Medicare Part D: 10 Years of Success” INFOGRAPHIC. Ten years after Congress launched Medicare Part D, the vast majority of seniors are happy with their prescription medication coverage under the program, according to a recent survey. A staggering 88 percent of respondents said they’re satisfied with their Medicare Part D coverage, and 80 percent feel their medication plan provides a good value, according to a 2016 study commissioned by Medicare Today. The program’s popularity is due, in part, to the convenience of the plans and affordability of the monthly premiums, which run as low as $11.40. And it’s not just seniors who benefit, according to economists. Indeed, health economists have found that Part D makes up only 10 percent of total Medicare funding but has been responsible for 60 percent of the Medicare spending slowdown since 2011. Part D has cut down hospital admissions and total Medicare spending by $1.5 billion a year, according to a study published by the National Bureau of Economic Research. “The public-private partnership has been the key to the success of the Medicare Part D program,” Herrick said. When the program was developed, Congress debated how much the government should interfere with pricing negotiations between insurers and drug makers and reached a compromise; private insurers would administer plans and negotiate the prices, and the government would subsidize those plans. Many economists agree that direct negotiations by the government wouldn’t make much difference. Despite the success of that decision, some policymakers in Washington are now pushing the government to meddle with the pricing negotiations between private insurers and drug makers, claiming that billions could be saved. Instead, Congress could be looking at other opportunities that could make a meaningful improvement in the lives of the 41 million seniors covered by Part D.
Devon M. Herrick, a senior fellow at the National Center for Policy Analysis, believes that government negotiations in Medicare Part D would not lower medication costs. Take specialty-tier exceptions, for instance. If a senior believes how much they are required to pay for their medication is too high, they can ask for an exception and could pay less. However, they cannot do so for therapies in specialty tiers, which require patients to pay up to 33 percent of the cost. Congress should pass the Part D Beneficiary Appeals Fairness Act, which would extend exceptions to specialty tiers. Another meaningful change would be more oversight of policies like step therapy, which requires patients to try one treatment before their plan covers another. As a result, patients may be given ineffective medication and wait longer than necessary to get the therapy prescribed by their doctors. Policymakers should ensure such tactics are supported by clinical evidence and have an appropriate appeals process. Part D is satisfying seniors’ needs and reducing other Medicare spending—all while costing $348 billion less the initial projections. Instead of trying to squeeze pennies from a cost-effective program in ways that would undermine its success, the government should be looking at how to build off this foundation and protect the health of our seniors.